During the ideas factory at our recent AGM I floated the idea of forming a local guerrilla gardening troop. Interested parties could share information on suitable sites, support each other with planting events and help raise funds for future raids. 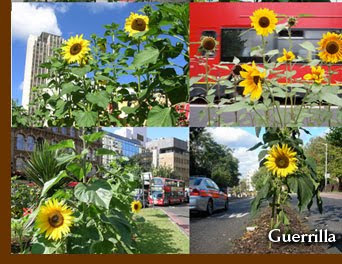 Browsing on the internet I discovered there is an International Sunflower Guerrilla Gardening day planned for May 1st. See http://www.guerrillagardening.org/ for more information. Anyone who is interested in sowing some sunflower seeds this coming Sunday meet me at the Harold Road Community garden at 2pm (on the corner of Harold Road and Tottenham Lane N8). We can go and plant some sunflower seeds and talk about forming our troop. Looking forward to planting some little sunshine bombs in Crouch End. Where shall we do this? I favour a much discussed, and just a little overprotected, architectural gem in the centre. AGM and Ideas Factory - the pictures!